Panormos, 37003, Skópelos, Sporades Islands, Thessaly, GREECE. 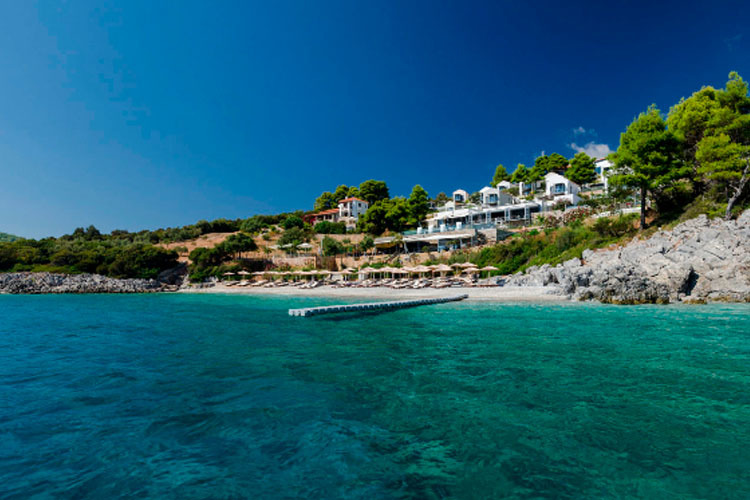 This fabulous property enjoys a spectacular location on Adrina beach, on the island of Skopelos. 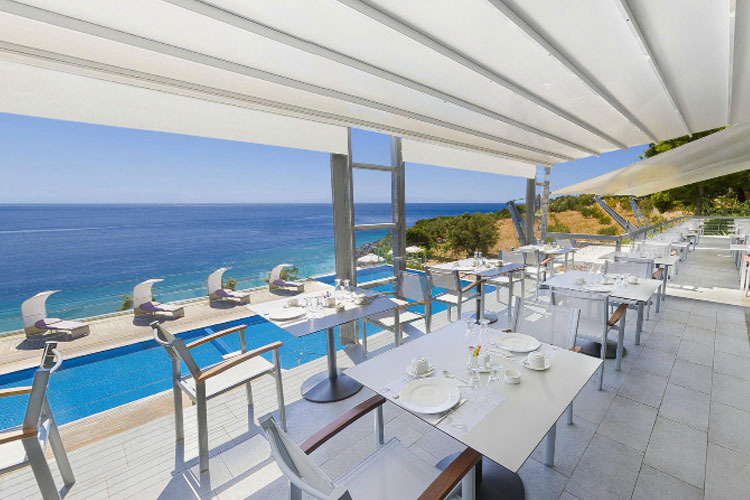 Cascading down to the water like a modern amphitheatre, Adrina Resort & Spa is a luxury boutique resort offering exclusive accommodation, delicious Greek cuisine and a fantastic range of bespoke facilities in an idyllic island setting. 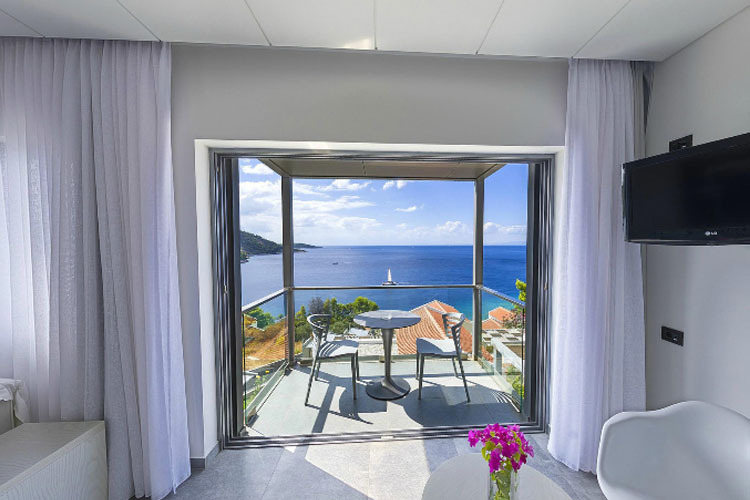 Reflecting Skopelos' justified fame as one of Greece's most beautiful green islands, where many scenes from the hit movie "Mamma Mia" were filmed, Adrina Resort & Spa offers crystalline waters on a delightful pebble beach, along with a large ecologically friendly sea-water swimming pool. A range of water sports are available on-site, while the Skopelos diving centre offers scuba-diving courses and dives for all skill levels. There is a jetty for small boats, as well as a number of moorings for yachts in the safe, sheltered bay. For easy access to all facilities, the resort boasts a unique cable-car, with stops on all levels. 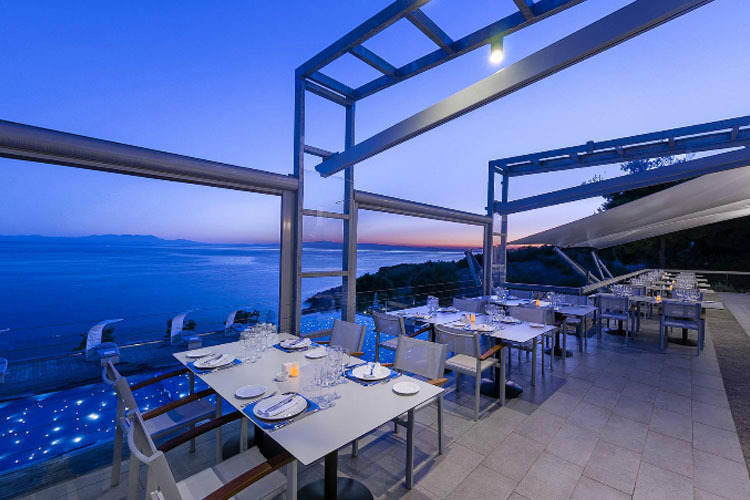 Adrina Resort & Spa's Kalimera and Kalispera sea-view restaurants serve delicious Greek cuisine based on traditional recipes and the finest fresh local produce, including freshly caught fish and seafood from the island's fishing fleet. 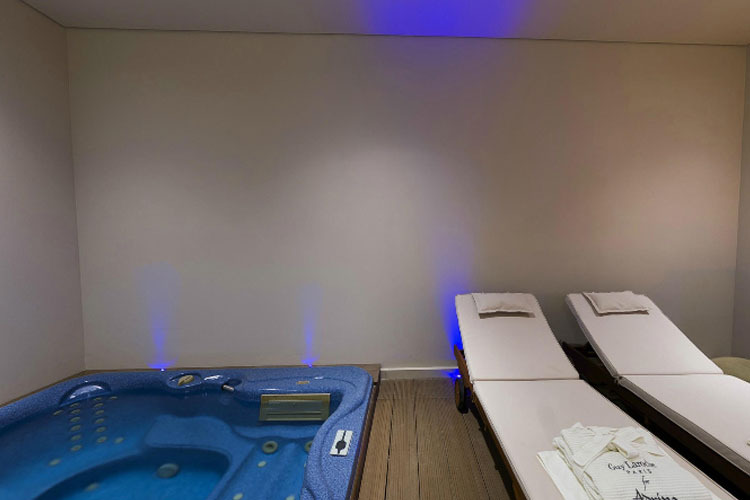 For the ultimate in pampering, guests can also take advantage of the resorts Skopelos Spa and Wellness area, with a Jacuzzi, steam bath, a fitness area and a range of massages and treatments. 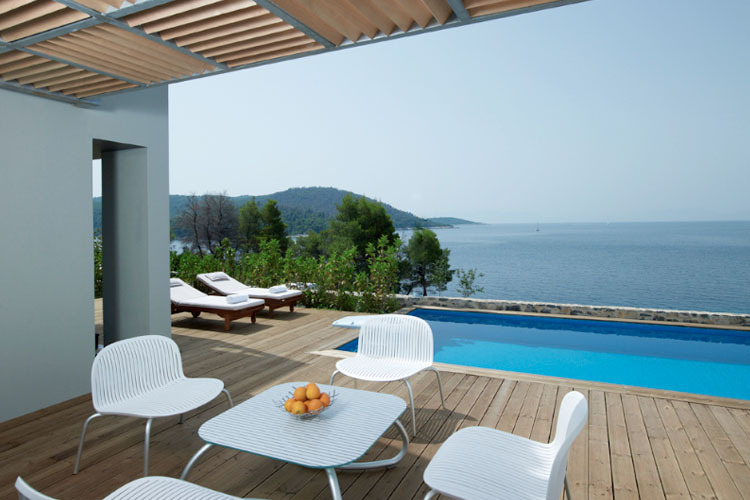 The Adrina Resort & Spa is a unique resort on the island of Skopelos. 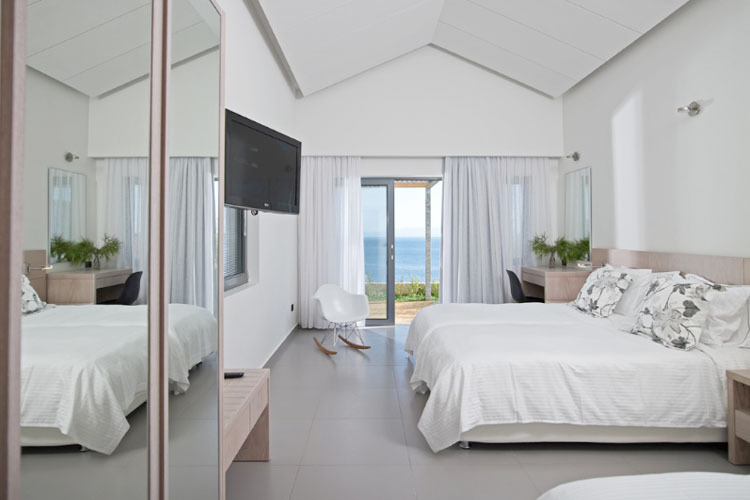 These Double rooms with panoramic sea views are carefully designed to guarantee the complete comfort of discerning visitors. 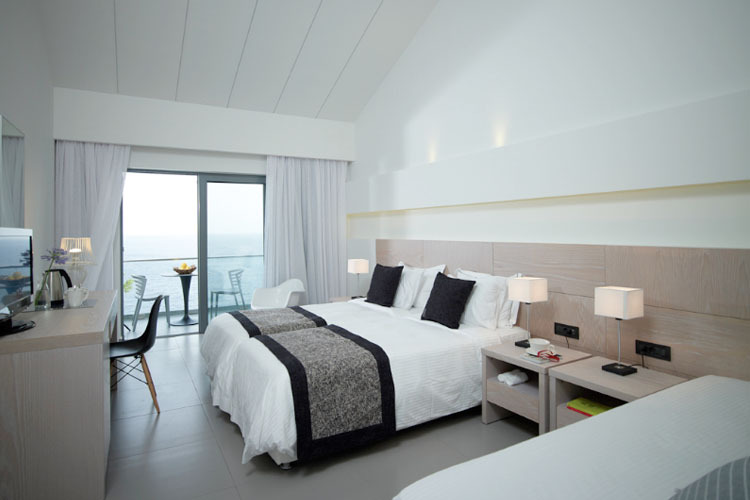 They feature modern furnishings in soft colours, luxurious linens and unparalleled bedding for top sleeping quality. 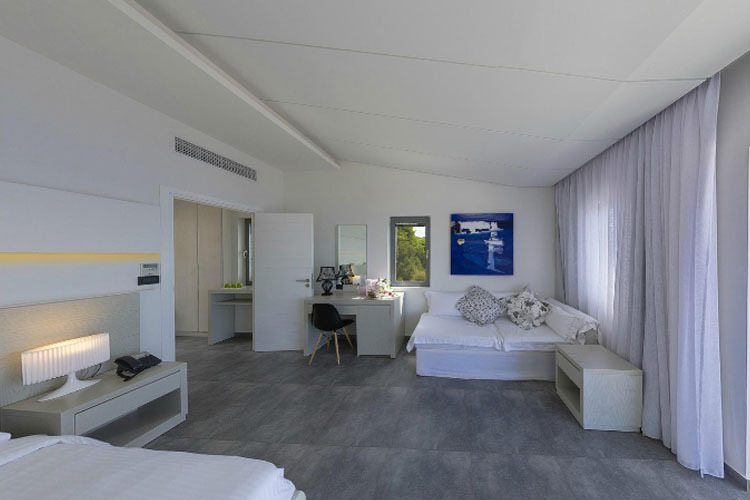 The Adrina Resort & Spa triple rooms are ergonomically designed and offer comfort and quality accommodation to discerning guests. 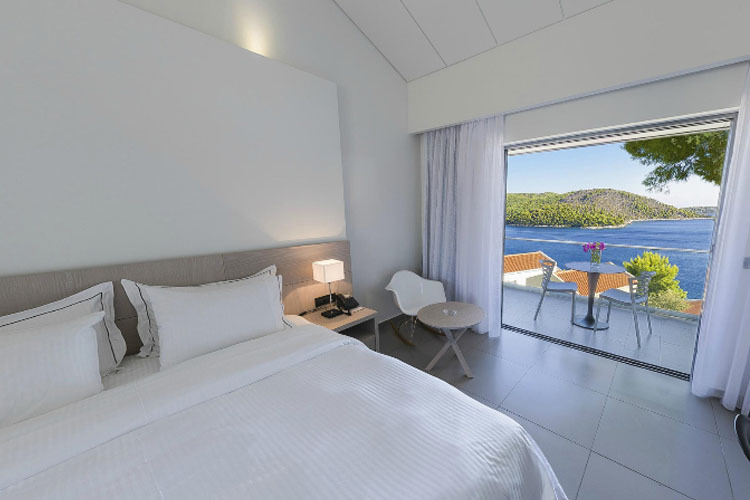 These luxurious air-conditioned rooms feature a balcony with panoramic sea views to Panormos Bay. Luxury linens, modern furnishings and top quality bedding guarantee supreme leisure. 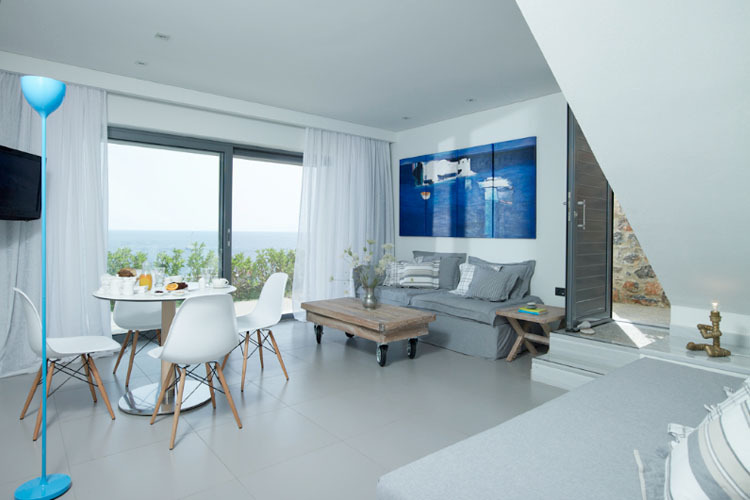 Room size 27 sq m.
With all the comforts of a holiday residence, these villas are distinguished by their minimalist and functional interior space and open terrace with stunning sea views. They feature a triple bedroom with TV, a luxurious bathroom, and a large living room with a sofa that can be converted into two beds. 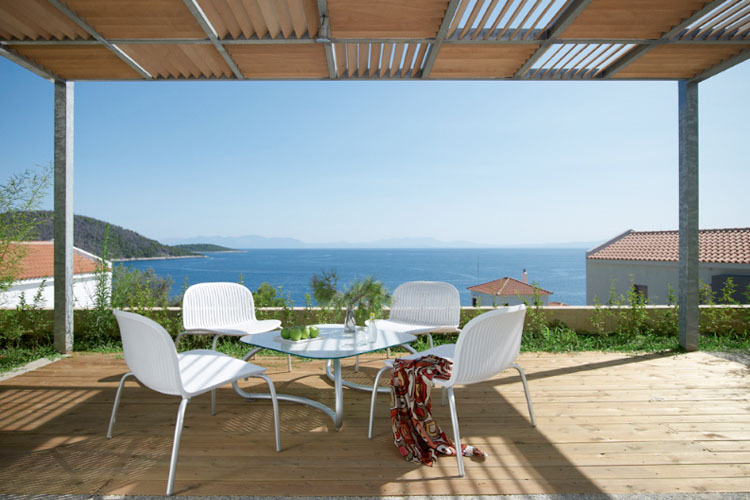 The villa is designed to be spacious and functional for a small family. Ideal for families up to 4 persons (2 Adults + 2 Children with a maximum of 5 guests). 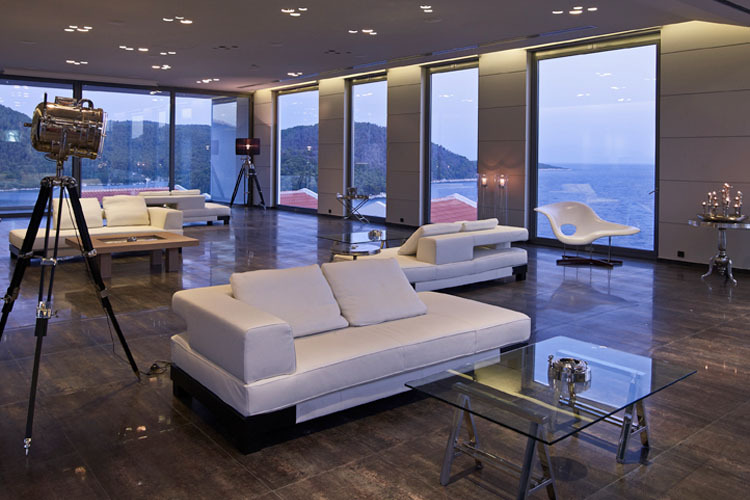 Villa size 60 sq m.
With all the comforts of a modern home, these villas are distinguished by their stylish and functional interior space and a large open terrace that gazes out to the horizon. They offer discreetly luxurious accommodation. 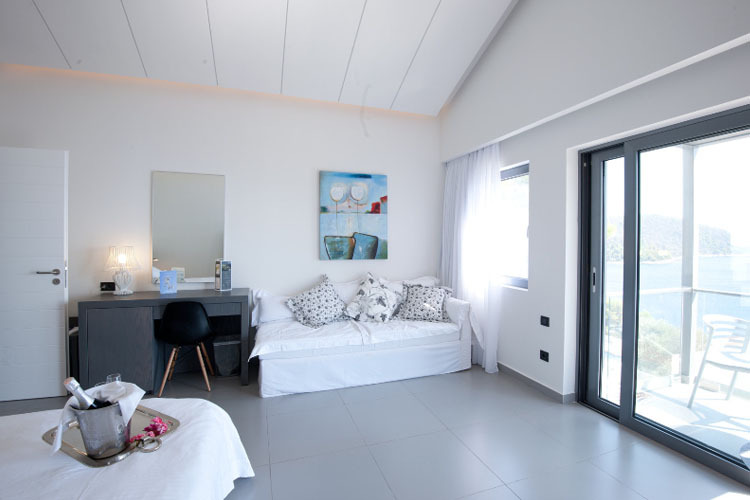 The bedroom, with twin beds, is located on the upper area, and also features a sofa-bed, a flat-screen TV, an en-suite bathroom and a balcony. Downstairs, there is a living room with 2 sofa beds, 1 child's bed, and a bathroom. There is also a private garden with beautiful sea views. Ideal for families of up to 4 persons (2 Adults + 2 Children, maximum 6 guests). Villa size 85 sq m.
These luxurious villas embody the ultimate combination of 5 star comfort and aesthetics. They are the ideal option for those who wish to enjoy their holiday in total privacy. 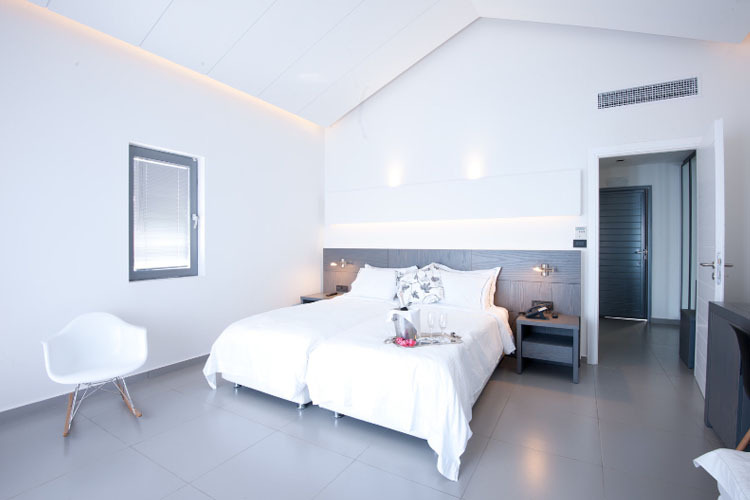 The upstairs area has a bedroom with twin beds, a sofa-bed, a flat-screen TV, an en-suite bathroom and a balcony. 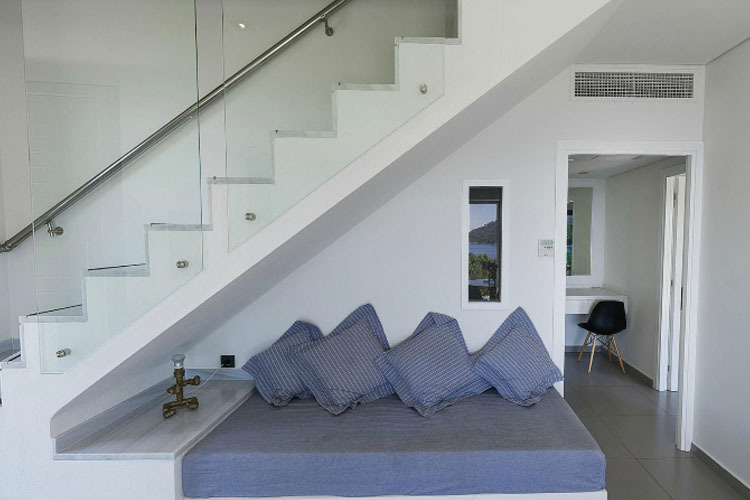 Downstairs, there is a living room with 2 sofa beds, a child's bed and another bathroom. There is also a second bedroom with twin beds and a sofa-bed. There is also a private garden with a sea view. 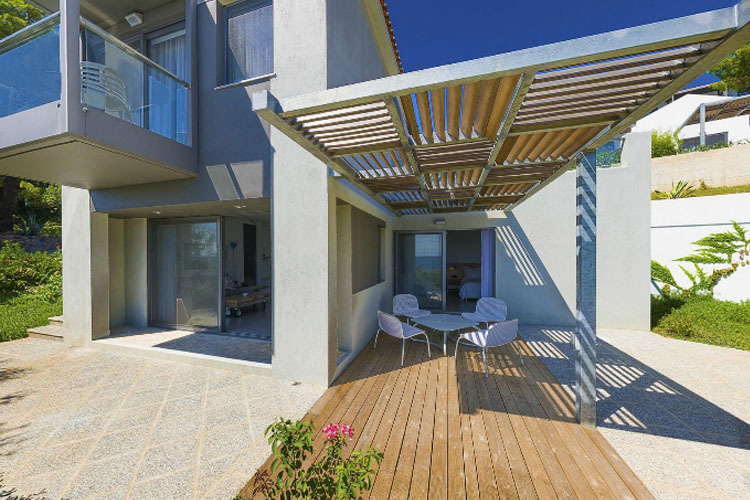 These villas are ideal for families up to 6 persons (4 Adults + 2 Children, maximum 9 guests). 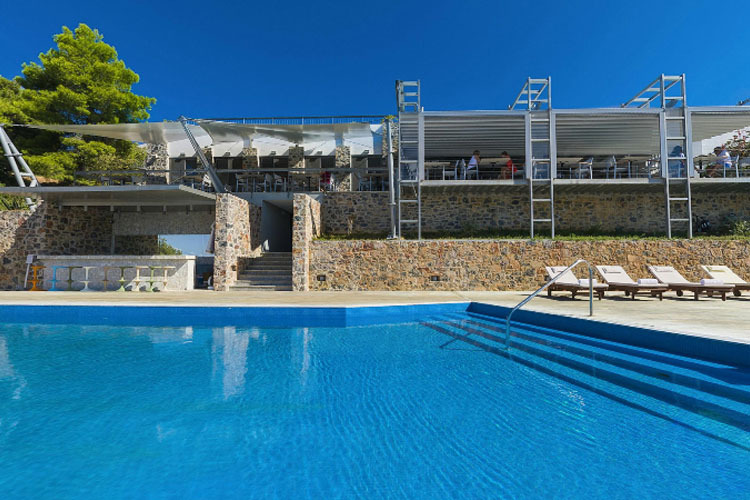 Villa size 110 sq m.
With magnificent views of the endless blue of the Aegean, these fabulous villas offer the ultimate luxury and total privacy. 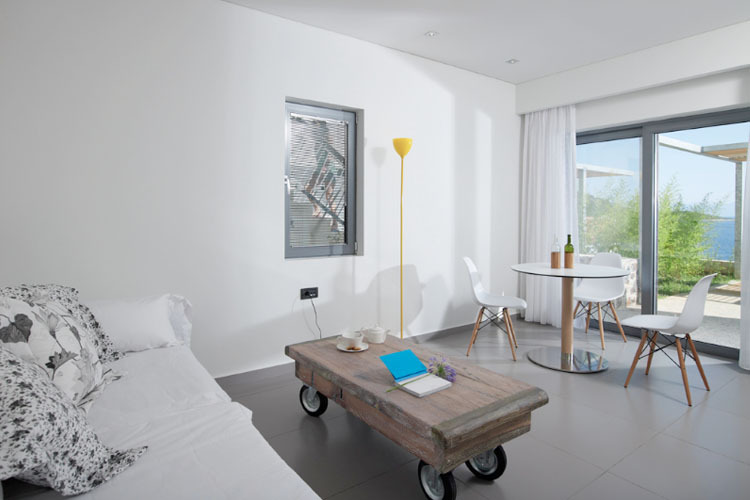 The upstairs area features a bedroom with twin beds, a sofa bed, a flat-screen TV, an en-suite bathroom and a balcony. The downstairs living room features a double sofa bed, 1 child's bed, a flat-screen TV and another bathroom. 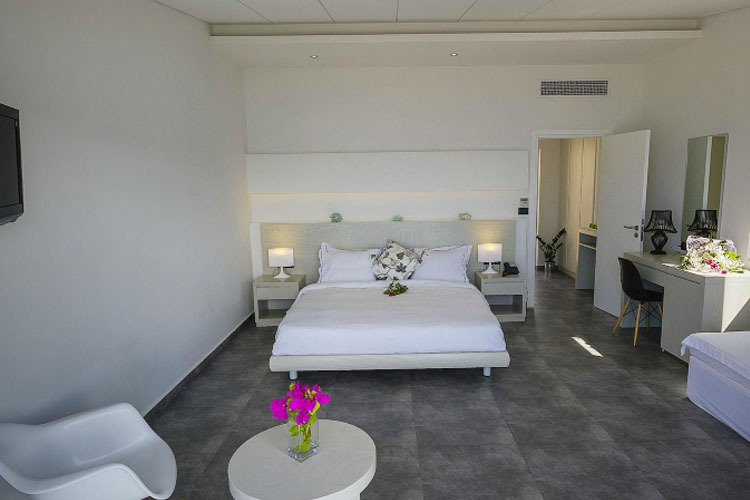 There is also a second bedroom with twin beds, a flat-screen TV and a sofa bed. Outside, there is a spectacular garden with a private pool and sun loungers. 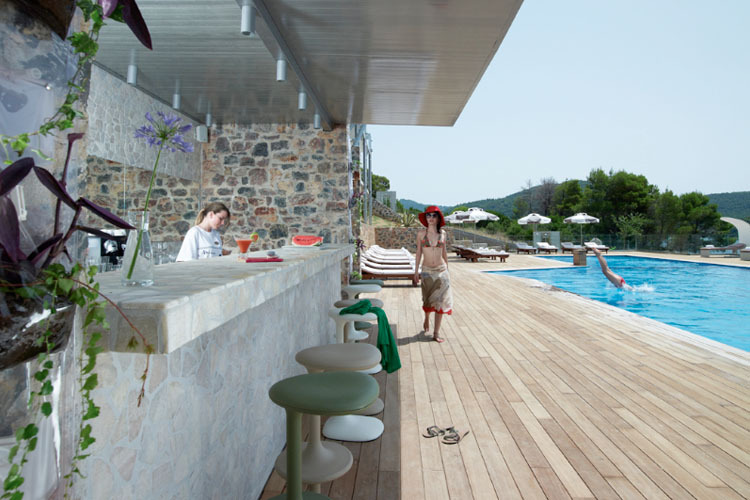 These villas are ideal for families up to 6 persons (4 Adults + 2 Children. maximum occupancy 9 persons). Villa size 110 sq m.
All rooms and villas feature the following amenities: air-conditioning; 32" flat-screen TVs with satellite channels; queen-size bed or twin beds; Guy Laroche quilts and linens; COCO MAT pillows and pillow menu; bamboo fibre bathrobes and slippers; BVLGARI toiletries; hair-dryer; mini-fridge; kettle and daily supply of coffee / tea; safety deposit box; voltage 220 volt; international direct dial telephone; free wireless internet access; wake-up service; room service; baby cots. There are a number of scheduled ferry services to and from Skiathos, Glossa, Volos, Agios Konstantinos and Alonissos. The spa is open in July and August. Period of closure: Closed from October to April. Languages spoken: Greek, English, Italian. Smoking policy: This property has non-smoking rooms and a designated smoking area. Credit cards accepted: Visa, Euro/Mastercard. 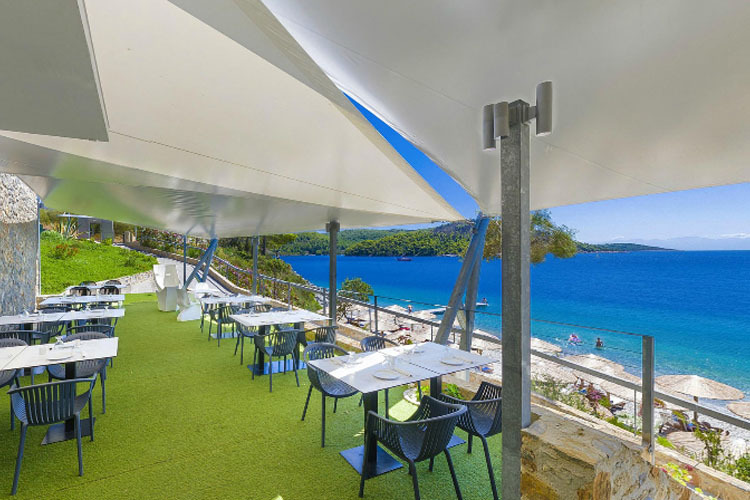 Nearest airport: Skiathos Island National Airport - 28,7 km.